This post is about how I used book giveaways to build a big list of targeted readers before published my first novel – it really helped with hitting #1 and getting a bunch of book reviews quickly. However, after getting over 50K readers on my lists, I realized I wasn’t engaging them enough – I didn’t have an autoresponder series to warm them up and get them to like me. I was building big lists but not getting enough value out of them, because I wasn’t focused on building the relationships. So recently I’ve been more focused on what to do after they’ve signed up for your list… how to turn them from subscribers to supportive fans. Here’s a video I made for a presentation in London at the beginning of 2018, it has a lot of specific ideas. For an in-depth tour of the various book giveaway software I use, here’s a more technical video showing how to actually set these giveaways up. Update: I got about 20,000 new subscribers this month running giveaways. I also got about 10,000 new likes and followers on social media. They aren’t cheap, but they are soooo powerful. Now I’m using giveaways to drive book launches and get more book reviews… I’ll post more on that later. This month I’ve been playing around with contests using Rafflecopter and KingSumo, and have gotten over 8500 new email subscribers. Contests are THE GREATEST way for new authors to build a platform, an email list, and get followers and likes to their social media account. Here’s what I learned, and how you can benefit. 1. Contests are great for engagement. I have a list of about 12K that isn’t that engaged, I might get 10% of them to click on something (and getting them to then buy or share is unlikely). But I can do a contest for something big and fun, and get that same audience to share my thing with their friends. So I put this contest together (free stay in a castle to write a book) – that giveaway is over but you can see how it looked. It’s gotten 4000 new subscribers in a couple days, with about $100 in targeted Facebook advertising. To make it work better though, I should partner with a few people with big overlapping platforms (offer them a free room too if they share it with their list, etc). I think I can use the giveaway to grow the list to 10k. I don’t like reaching out and asking peers to share my things, but the castle idea is big enough most people feel comfortable sharing it. It’s free and easy to signup, so it’s not like they’re sharing a course or product or something. I get lots of signups for low value stuff like book templates, but people don’t remember who I am. Something big like this is good for branding and visibility. Give away something awesome that people will remember. 2. Easy to build a very targeted list. I also started this one, for 10 signed YA books (also ended). 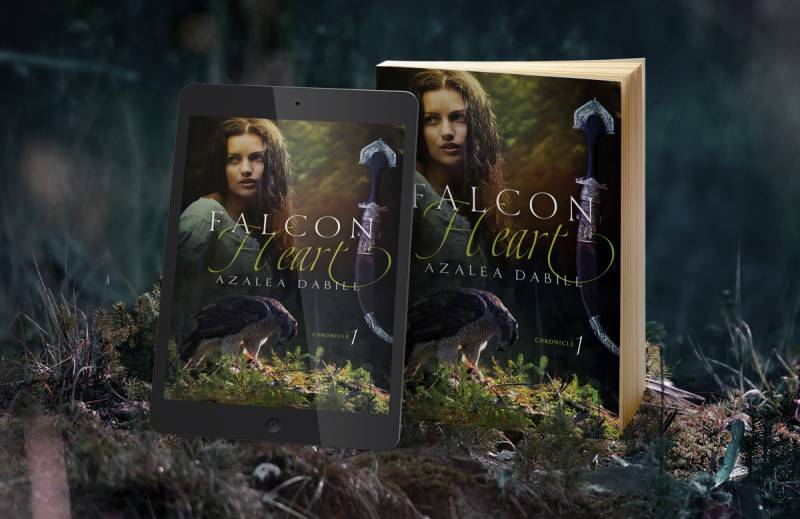 Books are a great idea because you can give away a package of bestselling books for any genre or subject; you can also ask the authors if you can buy a signed copy and see if they’ll share your giveaway with their fans. If you do 10 authors and get one of them to share your contest, that’s a big win. You can also target people who like those books or authors specifically. This giveaway grew a new email list from zero to 6500+ in a week, and I’m going to do another one next week and try to reach 10K. You could use a books-package giveaway to build a list before any product launch. Find book bloggers or authors in your genre that you want to network with. Instead of asking for a review, it would be better to start off giving – say “I want to offer a group giveaway, can I buy a signed copy of your book and include it?” Then you’re doing them a favor, and getting them involved so they’ll share your contest. If the contest goes well you can build a list and ask people to buy the books after it’s over – authors should see a bump in sales which is good for them. THEN you can ask for a review of your book, and it should be much easier (plus now you have a big list). Everybody who shares your contest is linking back to your contest page on your site, which is good for traffic: also a lot of people are following me on Twitter because it tags me every time someone shares the contest. So it’s a really fast way to get a lot of targeted followers for Facebook and Twitter (good social proof when you’re starting something new and need numbers quickly). Update: I just discovered “Gleam” and I like it a lot. It’s kind of the perfect blend between KingSumo and Rafflecopter: it’s well designed, adds a contest into a page or post, and has a lot of different choices and ways to enter. I especially like the “write a blog post about this”… you could JUST do that one and get a BUNCH of links back! 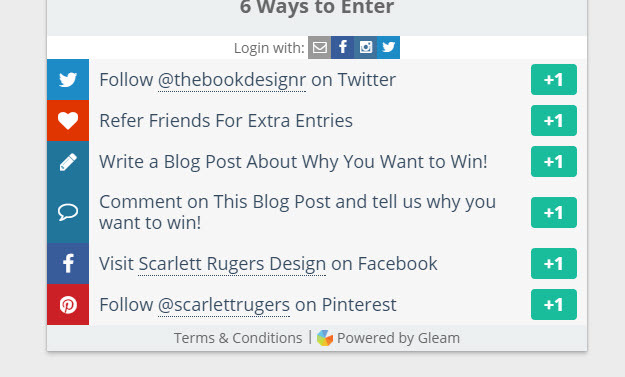 This is a contest Scarlett Rugers is running (that’s how I discovered Gleam); I’ll probably just use it from now on. KingSumo is more attractive, and better for just getting emails, and then encouraging sharing. Rafflecopter is put on a WordPress page or post, so I use it for smaller contests: maybe a big one first with KingSumo to get them on a list quickly, then a smaller one with Rafflecopter where they can actually see my blog and find out more about me as they sign up. Rafflecopter also has a lot of different features, so they can earn more points if they do a bunch of stuff. So you can get them to like you on Twitter, Facebook, join your email list, and even pin something to Pinterest (pretty awesome for getting a few thousand links from Pinterest). You can add your own too, follow on instagram, leave a comment, etc… It can be really good if you need one thing done or want to boost your numbers somewhere quickly. That’s on ebay for $600. 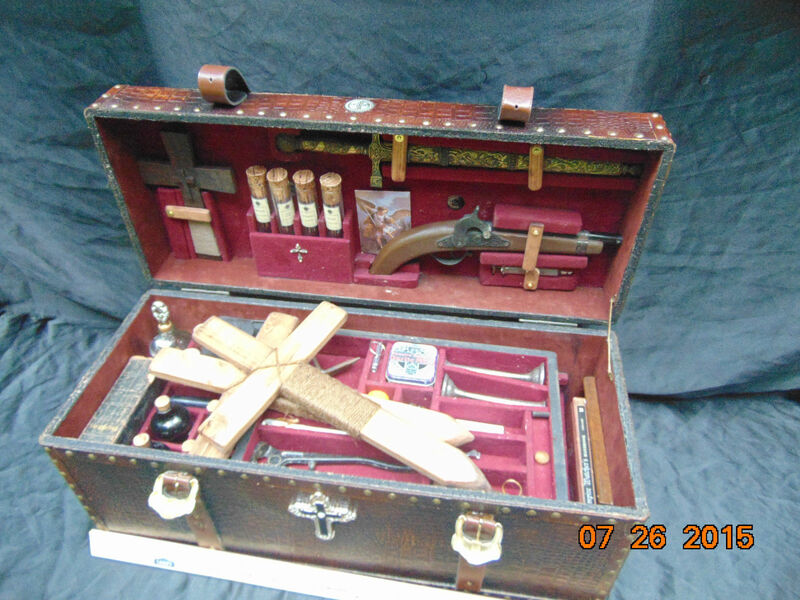 It’s a full vampire hunting kit of awesome goodies. $600 is a lot to spend, but think about how much you actually spend on marketing in a year. With this prize I could probably grow a brand new list of very targeted readers to 5,000. Can you make your money back? It depends. I probably can’t sell them my book right away, but I could probably get a couple thousand of them to download it for free. That would spike my ranking up to the top of Amazon. If they all liked my book and I had another incentive for reviewing, I could probably set that at 99cents and continue selling well. (So you could spend $600, then wait till you make your money back, then do another promotion). My point is: do one, big awesome contest, instead of lots of little $20 promotions that don’t work. Plus, using a contest to build a list is SO easy, and lets you control your relationship with readers, so you’ll save hundreds of hours of stress trying to tell people about your book. You can just email them. But it doesn’t have to be a huge thing. Right now I’m working with Azalea Dabill to redo her author platform. These are the new covers we designed. We can find a cool dagger like that on ebay for under $50 and use that as a giveaway. The trick is, you don’t want to run a giveaway that anybody will enter. A lot of people might like that cool old dagger, so I don’t want to share it with everybody. I don’t want everybody signing up, just people who might like my books. So Azalea would want to find maybe 3 bestselling YA fantasy books and authors that are very similar to hers. She could giveaway those three books AND the dagger – and then email those authors and ask them to share (or ask to buy a signed copy if it’s possible, it’s more likely you’ll get them to share). But even if those authors aren’t involved, you can target people on Facebook who look those 3 books or authors. You can set location and age and a bunch of other things. So you might want to define a very specific audience. For Azalea, maybe Christians between 14 and 26 who like specific types of fantasy books. Then, you’d spend $50/$100 on ads just to them (so they will see your contest, but not everyone will). I’d spend all that money on the first day of launch, get the ball rolling and have them start sharing with their friends, who probably have similar interests. The trick is to “weed out” people who aren’t a good fit. So you want books that don’t just appeal to everybody, but books a certain type of people will know about. I boosted that post and it gets more engagement than other things I’ve done. And having a whole bunch of comments on the post is great for social proof – also a lot of people are liking the Facebook page even though they don’t have to to join the contest (from zero to 500+ in a week). So if you’re starting out and want a Facebook page or group (I would recommend a group, but that’s a different topic), contests are an easy way to get a lot of likes and follows, without even asking for them. Just remember, you want to give away something they already want. You don’t have time to educate them about you or your product. You need to give them stuff they already know about and want, but wouldn’t buy for themselves. Some people say contests don’t translate to sales – because people just sign up for free stuff. But you can control that by targeting with Facebook ads. Get 1000 of your ideal clients to sign up, and then get them to share with their peers. If you have high-end clients, you might need a really large package or something awesome. But try and make it fun and unique enough that they will share, so it’s about more than just the value of the prize, it has to be something cool. The list should already be pretty warm because it’s focused (I know the people on my list want those specific YA books, so they might like similar products; or that they’re writing books so may need publishing services). But I still need to build the relationship, teach them who I am, get them to like and trust me, etc before trying to sell them anything. KingSumo is $198 for one site licence; but I think you can use it on different sites at different times. I’m going to do different giveaways on all my sites to boost SEO. Rafflecopter is $13 or $84 a month depending on options. Gleam is $39 per month. Plus the price of the item(s), plus Facebook advertising. It’s not the cheapest form of book marketing, but most of the other stuff I see authors doing don’t work at all. ALSO, once you get a big list, you’ll probably be paying a monthly fee to Mailchimp or your email provider. I think it’s roughly $10/1000 subscribers, so for 15K subscribers I’ll be paying $150 a month. If you aren’t earning that money back, it’s obviously not ideal. After you get a lot of people on your list, you want to keep the ones that are interested in you and your books. For me, I might ask for beta readers, and see if I can get a couple hundred of them on another, smaller list. For the bigger list, after you send out 5 emails are so, see if you can delete all the ones that aren’t opening your emails, or only open for free contests but don’t open the other emails you send. It’s OK to delete them if they are never going to become buyers, though it could just mean you haven’t warmed up that relationship enough yet. It might prove difficult to use your new list to make any money, so I wouldn’t try to do it directly. For me, I’ll use my list for reviews and a boost in ranking on free campaigns, hoping that OTHER people buy the book when they see it rocket up to the top of Amazon. But I would also recommend sharing a monthly newsletter, like “My top favorite YA fantasy/scifi/business/your-genre books of December 2015″… etc. Do it every month so they keep opening your emails. Give a brief review of them and use your Amazon affiliate link for the book you recommend. If you can get a couple hundred people to buy one of those books, you’ll make a good chunk of change. You could also charge other authors for promotion, but I’d be wary of this. Instead I’d look for quality authors in your field or genre and ask if they’d like you to email your huge, targeted list about their book (easy way to get their attention and trust). They’ll say yes, you email and get them some sales, now they’ll be very open to working together with you or recommending your book to their followers. The biggest risk is: will you earn your money back? It depends on your product and how well you build the relationship. I’m OK spending money because I’m launching 10 different series soon, which eventually will be about 50 (or 200, if I serialize them) books on Amazon. They aren’t awful and the covers are beautiful. It’s hard to make money if you only have one book. You might want to start small. On the other hand, I know that I’ve done everything I can: I’ll build a list to 10K young adult readers. If they don’t like my books, then nothing I do is going to work. But if even 1/4 of them like my books, I’ll be able to get maybe 1000 reviews if I give them a free copy and offer incentives. And if I have good looking books with 1000 reviews, they will sell, consistently, for a long time. I’ll write another post soon with the results of all of these: how many sales/reviews came from this list I built. You can see my launch page for my first book here. Also: I’ve been noticing, with contests, there are a bunch of fake accounts and spambots who just sign up to win stuff. That happens. I don’t know how many of my signups are fake yet, but it could be as much as 1/3… if you chose a winner, make sure they are a real person (their name matches their account, they post real stuff and not just more contests, etc). If you see someone that doesn’t look real, I think it’s fair to pick another winner. These videos are meant for authors, specifically on how to use bestselling books in your genre to build a genre specific list, but can really be used for building any kind of online platform or business quickly. After several more months I learned some new things about why my giveaways are more successful than other authors who are trying this. I usually don’t use amazon credit but added it this time because 8 signed books didn’t seem exciting anymore. ★kingsumo works better because it’s clean and simple and looks good, instead of a giveaway that’s embedded in another site or blog. ★oh and I would also, usually, tweet the giveaway every couple days but TAG one of the authors in the giveaway, like “I loved (name of book) so much I’m including it in my ‪#‎giveaway‬ of ‪#‎freebooks‬. @authors name.” I don’t always do this, because it feels a little spammy, but almost always if you’re sharing an author’s book with a giveaway that’s free promotion for them and they’ll be happy to share it. I’m learning more all the time, make sure you watch some of my more recent videos.